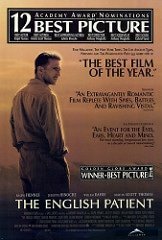 The English Patient was the most acclaimed film of 1997. 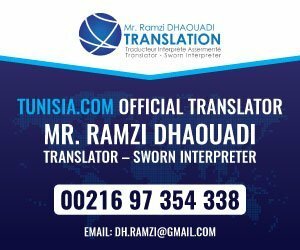 It received nine Academy Awards and also won Oscars for Best Film, Best Producer and Best Shooting, thanks in part to the magnificent setting in Tunisia. The film, The English Patient, was based on a novel by Michael Ondaatje of the same name. It was directed by Anthony Minghella, produced by Saul Zaentz and starred Ralph Fiennes, Juliette Binoche, Willem Dafoe, Kristin Scott Thomas, Naveen Andrews and Colin Firth. 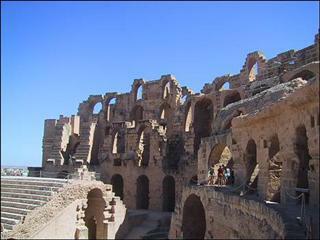 The film also used a dozen Tunisian professional actors and around 3,000 extras. The film was released in November 1996 and cost US$27 million. However, it grossed over US$231 million. The English Patient is set in World War II and is about love, misunderstanding and healing in a quirky story about the twist of fate. The English Patient, Count Laszlo de Almasy is played by Ralph Fiennes who is critically burned and nursed by Hana (Juliette Binoch). Flashbacks show his previous work as a cartographer making a map of the Sahara. His affair with Katharine Clifton (Kristin Scott Thomas) eventually leads to him being severely injured by her jealous husband and she dies. Whilst being cared for at the monastery/hospital another visitor arrives, David Caravaggio (Willem Dafoe) who has lost his thumbs whilst under German interrogation. He is in fact a spy and a thief. It transpires that it was the English Patient, Count Almasy, who caused his torture and Caravaggio is hunting down those he feels were responsible for his suffering. When he confronts the Count, he eventually learns the circumstances and forgives him. Meanwhile Hana has a romance with Kip (Naveen Andrews), a bomb defuser. Hana is convinced that anyone who comes close to her ends up dying but eventually overcomes her fears. The end of the film sees the Count dying of a morphine overdose, unable to come to terms with his injuries. The film is set in Italy with flashbacks to the Sahara and Cairo. Much of the filming took place in various places in Tunisia as it was thought it better reflected Cairo in the 1930s, the time of the flashbacks. In particular, Cairo was sparsely populated in the 1930s but by the 1990s it was much busier. 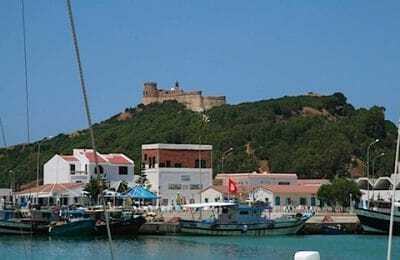 The architecture had also changed whereas the chosen sites of Tunis, El Mahdia and Sfax more perfectly represented the historic era. Filming in Tunisia lasted altogether for nine weeks. Two scenes of the story were set in the British Ambassador’s residence in Cairo. One was a formal dinner party hosted by the Ambassador and the other was the Christmas celebrations of the British Colony in Cairo. The production designer, Stuart Craig, looked at several villas in Tunis to find a building that had authentic Islamic elements in the architecture, age and design. The villa that was eventually chosen had beautiful arches and ceramic work and an open courtyard which worked well, projecting the idea that the streets of Cairo permeated the very residence of the Ambassador. The Christmas party showed the incongruous way that the characters were at odds with the stifling heat of their environment as they sought to recreate an English celebration. The souk at Sfax is the covered market within the old walled city, known as the medina. It was there that Katherine and the Count strolled through the narrow alleyways in what was purported to be the medina at Cairo. After filming the scenes at Sfax, the film crew moved to El Mahdia, between Sfax and Sousse. El Mahdia was used as the port city of Tobruk. 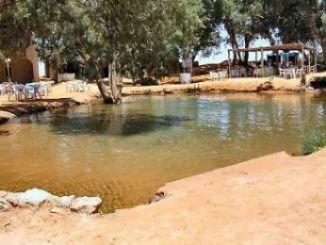 The unit then travelled six hours southwest to Tozeur which is close to the border with Algeria. Traditionally the town has been the staging post for caravans of Bedouins moving from the desert across to the Mediterranean coast. Around Tozeur there are several oases and it was the ideal desert landscape for filming desert scenes without the need for any special effects. Finding the correct type of sand was important to the authenticity of the location and the Sahara sands around Tozeur were ideal for the purpose. The scene where Katherine (Kristin Scott Thomas) dies in a cave was shot in a canyon near Nefta. Located 45 km from Tozeur, the dry salt lake known as Chott El Jerid was used as the location of the base camp for Count Almasy and Madox. Again, the undulating dunes which have been carved by the winds gave the correct feeling that they had been there forever. Nearby scenes were shot beside the strange rock formation called Onk Jemal, 30 km north of Tozeur. The name translates as the Camel’s Neck.The strange rock resembles the head and hump of a camel. The location was only reachable using 4-wheel drive vehicles such as were used on desert expeditions. One problem was that the road petered out miles before the oasis so Line Producer, Alessandro von Normann, had to supervise a road building scheme to get the transport vehicles along the former sandy donkey track. When it was completed they named the new road the Saul Zaentz Imperial Highway after the film’s producer! Filming in the Tunisian desert was difficult and precarious at times, particularly when the crew had to reach the oasis of Tamerza. The narrow, winding road passes through the Djebel en Negueb which is an off-shoot of the Atlas Mountains. It runs beside a 1,000 meter drop into a gorge and the road was layered with treacherous mud. It had many dangerous hairpin bends which were particularly tricky for the crew to navigate after rain. Other filming took place at the remote Cave of Swimmers, deep inside a crevice in the hills at the desert town Degache. It was inaccessible by ground vehicles so the sound and camera equipment had to be transported by donkey train and the cast and crew had to struggle in on foot which took about 25 minutes. In order to get authentic 1930s costumes the film unit had the formal dinner clothes made on Savile Row by the former tailor to the Duke of Windsor to ensure that every last detail was correct to that era. The military clothing and uniforms were also very authentic. They had been designed by Nathans for the British and Canadian Army. After the war the uniforms were bought up by the costume house of Angels Berman who loaned them for the film.